Stale Gum: How I've spent my Memorial Day weekend (so far). So yeah, thanks to my totally awesome MySQL Skillz, I completely fucked up the entire Baseball Card Pedia database; and in the process completely screwed-up Chris Thomas' weekend. According to BCP, Prince Fielder is now listed on 99 44/100% of all baseball cards ever printed. But I don't blame myself for this error. Oh no. 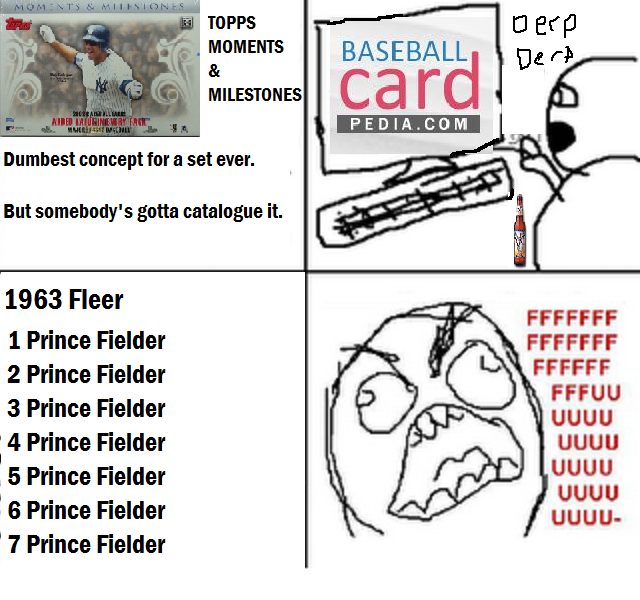 I blame Topps for putting out such a complicated card set. If not for Moments & Milestones, today's tragedy would have been avoided. Hopefully we have the dbase backed up, and will get everything back in order soon. Now if you'll excuse me, I have beer and blasters to attend to.